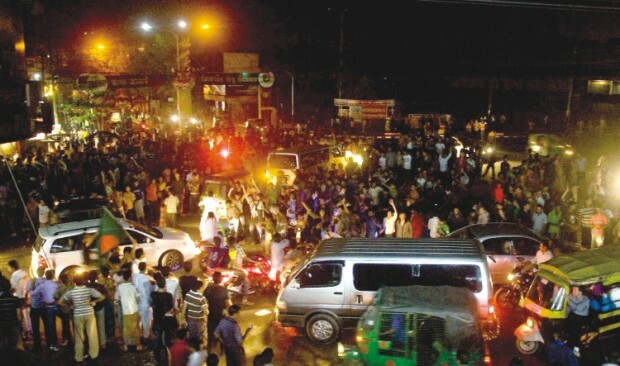 Grand celebration after Bangladesh's heroic win against England, Photo: Star File. Sport fanaticism is an age-old concept. There have been crazy supporters in every nation for every sport. We have seen the devotees of Sachin Tendulkar burn his posters when he scored a duck in an embarrassing defeat in a crucial match, we have seen the “civilised” British fans swearing publicly at the English cricket team after a white wash against Australia, we have also witnessed the Aussie Armies bullying the fans of the opposition out of pride and even racism but never had a citizen burnt the national flag out of anger after a hammering defeat before. Yes, after the rather historic defeat to the West Indies in the ICC Cricket World Cup 2011 on March 4, a few Bangladeshi cricket hooligans burnt our national flag and that was not the only shameful act we conducted. Before questioning the ability of our national cricket team, it's about time that we question our sporting spirit and civic sense as a nation. March 4, 2011- a disaster. Bangladesh faces a humiliating nine-wicket defeat against the West Indies, after being all out in 18.5 overs defending a score of 58. The frustrated spectators start cheering for the West Indian cricketers and booing their own ones. At one point during Bangladeshi fielding, the whole stadium starts chanting “bhua bhua” and throwing placards and other debris at the Bangladesh team. After the match, many of the frustrated Bangladeshi supporters burns the posters of the Bangladeshi cricketers, attack the bus of the West Indian Cricket team, vandalise skipper Shakib Al Hasan's residence and most atrocious of all, some of them burn the national flag of the country out of rage. Though a few Bangladeshi fans immediately plan to apologise to the West Indies team next morning and do so, Bangladesh spends the whole week criticising the Bangladesh team, mostly its captain. The masses are joined by the media and a few ex-cricketers in the brutal censure. Many of us even demand to cease the ICC's permanent membership status from Bangladesh, pick “actually good” cricketers with athletic bodies so that we are not intimidated by those big boys of the opposition, change the team formation and etc; suddenly the whole nation starts to understand cricket much better than ever before and of course much better than our national cricketers. Thus a single match turns our national heroes to arch enemies, the hope of the millions into an abyss of nightmares, the once-supportive fans into ever-angry delinquents and the once proud and optimistic press into a harsh critic. Other than some very few exceptions, no one stands beside that devastated team which suffered the humiliation first hand, no one decides to be there for them when they need us the most. March 11, 2011- a mood swing. Bangladesh cricket team snatches a cliffhanging two-wicket victory from the England cricket team. Suddenly, those who had burnt the posters of the eleven “bhua” cricketers start cheering for their “new heroes”, the skeptic media regain their trust on their “tigers” and the masses celebrate on the streets, university campuses and wherever they could manage to celebrate. One single match again changes everything for the country. Suddenly we all are again patriotic and in love with the cricket team. We start finding them so capable that we don't see any flaw in their tactics or in their batting/bowling styles. Our lost hopes surface again and we dream to conquer anything and everything on the way to the “cup that matters”. The newspapers that drew demeaning cartoons of the Bangladesh cricket team starts glorifying them with accolades. There is hardly any objective criticism on the fact that we lost five wickets within the span of only 14 runs; we were 155 for three wickets and the scoreboard flashed 169 for eight within few minutes; no one points out that it should have been a smooth win rather than a nail-biting one. 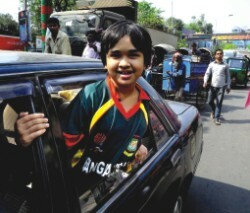 Angry and frustrated supporters venting their wrath on the posters of Bangladesh cricket team. The fact of the matter is, the national cricket team aptly earned its permanent status at the ICC; but we, the cricket followers of this country, are yet to adjust our nature with the standard code of conduct of a civil society. It was not our cricketers who breached a national law and burnt the national flag, it was not them who attacked the opposition for playing better, it was not them who could not deal with the fact that in cricket, like in every aspect of life, there are ups and downs. Shakib had politely accepted the wrath of the audience for the team's poor performance but we were too angry to forgive them. Our national team gifted the cricketing world with one of the most fascinating matches it had ever witnessed, yet we are too proud to apologise for our insolence. After the stunning victory against England, the Bangladeshi skipper didn't forget to point out that shot selection was still a problem for the team which means our team still had their feet on the ground even after a dramatic win. We- the followers, on the other hand, were out on the streets to celebrate as if we had won the World Cup. Tomorrow it's going to be another crucial match for our team and it is against another cricketing giant- South Africa. We might repeat the match against the West Indies, we might create history once again; one thing that remains unchanged that those 11 boys, all under their 30s, are representing the nation proudly on an international ground. We are not fortunate enough to be in the age of the 70s or the 50s where we could feel the overwhelming sensation of patriotism; it is this team that gives us the goose bumps of being patriotic in a whole new way. Let's be supportive to them no matter what and let's be objective when we criticise their performance. Let's be a sport during this grand event in the sporting world.